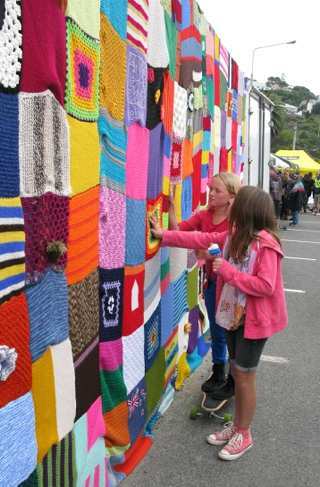 Strangers from around the world have sent hand-knit squares of wool to help Christchurch, New Zealand beautify their ominous earthquake protection barrier. Hundreds of giant shipping containers were placed at the bottom of cliffs to protect homes and cars below from falling rocks in the wake of aftershocks in June 2011 that shook the area and damaged homes. A local woman had the idea of creating a “shipping cosy” to cover one of the ugly containers, and invited the community to donate colorful squares of knit or crocheted wool to help brighten the blighted landscape. Not only did Sumner residents contribute to the public art project, but people throughout New Zealand, Germany, Sweden, Canada, Australia, Iceland and the UK. The project was launched in August by Christine Reitze with a Facebook Page, called Container Love. Reitze collected the squares and sewed them together on her sewing machine at home. After a wooden skeleton was erected, the Cosy was installed on May 8 in time for the town’s Sumner Street Party. The Christchurch area is home to others who have launched creative ideas about how to inspire their community since the February 2011 earthquake severely damaged New Zealand’s second-largest city and killed 185 people. Artist and Polytechnic Institute of Technology designer, Henry Sunderland used the one-year anniversary of the 6.3 magnitude quake to create a Flower Road Cone project for which people placed flowers in each orange road cone to remember those who lost their lives. His Facebook campaign led to flowers in cones popping up in Saudi Arabia, Britain, and Germany, too. All along the wall of shipping containers that line two seaside suburbs, makeshift art galleries have sprung up, including a five-metre-high canvas, organized by Sunderland, colored with marker pens and crayons by local children. The mural, 16 meters long, is thought to be one of the biggest coloring-book pages of its kind, he told Stuff.co. WATCH a video below that features much of the beautiful Container Art that has brightened the daily commute for residents.